Why choose a freestanding oven over an integrated model? Well, the best freestanding ovens are simpler and cheaper to install, you can take them with you fairly easily when you move house (making them the perfect option if you rent), and they're usually less expensive to buy. So, whether you’re looking for a basic model or something a little smarter, check out our choice of the best freestanding ovens. Ready, steady, cook! Looking for more kitchen appliance recommendations? Head to our appliances hub page. First of all, consider the size oven you want and the space available in your kitchen. All ovens on our list are 60cm wide or less, and have a main oven capacity ranging from 60 litres to around 80 litres. For larger freestanding ovens, see our selection of the best range cookers. As with other cookers, freestanding ovens come with a range of hob types, with reactive induction and gas designs more desirable than basic electric hobs. Consider installation when picking your oven's hob type: gas fitting from scratch will likely be trickier than providing power for an induction hob, although both will almost certainly require the services of a qualified professional to be fitted. Freestanding ovens can come with a range of special features, including fast heating, slow-cook, or a hot hob indicator. This freestanding electric oven has a generous capacity. The main fan oven has a generous capacity of 77 litres, plus there's an interior light and a right-hinged door. The second conventional oven has a 39-litre capacity and a grill feature with a drop down door. Both are A rated for energy and have triple glazed doors to ensure heat stays in; they also have an enamel coating inside for easy maintenance. The energy-efficient, fast-heating induction hob has four rings and a hot hob indicator to prevent accidents. The oven also comes with an extra large baking tray perfect for family meals as well as a grill pan. 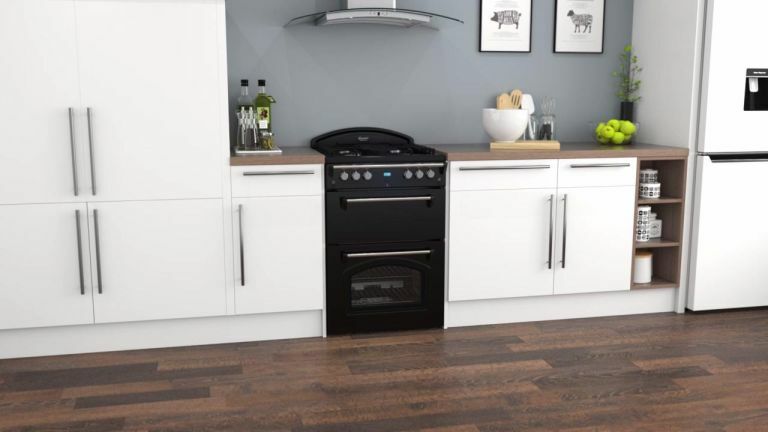 A great high street equivalent to the classic AGA, this retro-style choice from Leisure Gourmet has a main oven capacity of 78 litres and a second oven capacity of 34 litres. The two ovens are conventional, although the main oven has a slow-cook function, perfect for winter recipes, and the top oven has a grill function for quick crisping. The four-zone gas hob supports cast iron pans and gives instant heat as well as ample space for pots and pans. If you like the look of the AGA but want something more purse friendly, this is a great choice. The result of a Hotpoint and Jamie Oliver collaboration, this stylish freestanding oven has a main fan oven with a 71-litre capacity, and a second conventional oven with a 36-litre capacity. The main oven has a cooling fan to lower the temperature immediately after use, while the second oven features a grill that heats up in a speedy 15 seconds. There are a couple of handy maintenance features in this oven: both cavities feature catalytic liners to make cleaning easier and, when the temperature reaches 200°C in the main oven, it will begin a self-clean to oxidise grease and excess fats. An interior light allows you to monitor your dishes, too. The four burner gas hob features automatic ignition as well as enamel pan supports and a flame supervision device. When shut, the hob lid automatically cuts off the gas supply for safety and gives you useful extra worktop space; when open, it makes a neat splashback. A grill pan and roasting dish are also supplied. This black and stainless steel freestanding oven by Smeg offers both a multi-function and conventional oven so you can cook multiple recipes at once. Its main oven has a capacity of 60 litres and a circulaire cooking function to provide even heat throughout the cavity. The second oven has a 33-litre capacity and features an integrated grill that can be used with the door closed. Both have an energy rating of A and feature an easy-clean enamel interior. There's also a useful air cooling system to quickly lower the temperature once you've finished cooking. The ceramic four-zone ceramic hob heats quickly, and has hot hob indicators and automatic cut out to prevent accidents. Supplied with an extra deep tray, a non-stick tray and a roof liner. This no-frills electric cooker is our pick of the best freestanding ovens for those looking for something basic but functional. It has a twin cavity for more flexibility when cooking; one is a 62 litre conventional oven, the other is a separate grill with a 24-litre capacity. Both cavities have double-glazed windows and interior lights for easy viewing, as well as an easy-clean enamel lining for quick clean-ups. The electric hob has four zones. Supplied with a grill pan and handle.